Saturday morning was one of my favorite anticipated days living in this area-first nice Saturday to visit Ithaca Farmers Market on the waterfront of Cayuga inlet. It was chilly down by the water, but the sun and blue sky gave enough promise for spring, so we bundled up and headed downtown. Our new friend Kees Stapel, vineyard manager for Boundary Breaks Vineyard in Lodi, NY, had his table set up and was all ready to pour their vast array of Rieslings. They focus on and produce only Riesling wines, from drier styles to the sweeter, and even a silky late harvest. Check out their gorgeous website here: Boundary Breaks Vineyard Their web presence is only surpassed by the quality of the wines produced. The crew at BB take an amazing amount of pride in their vines, fruit, and creative process…and the hands on knowledge shows, along with the dedication they pour with. 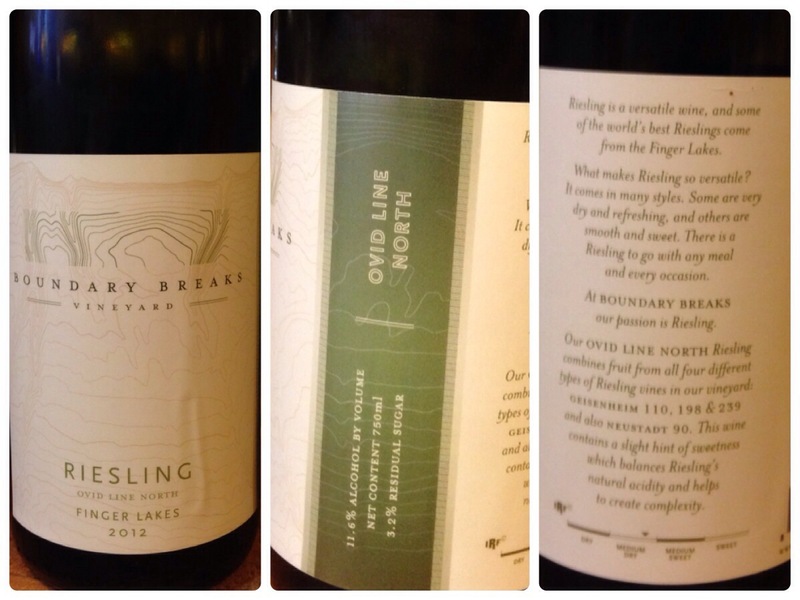 I went back after the tasting and grabbed the Ovid Line 2012 Riesling. 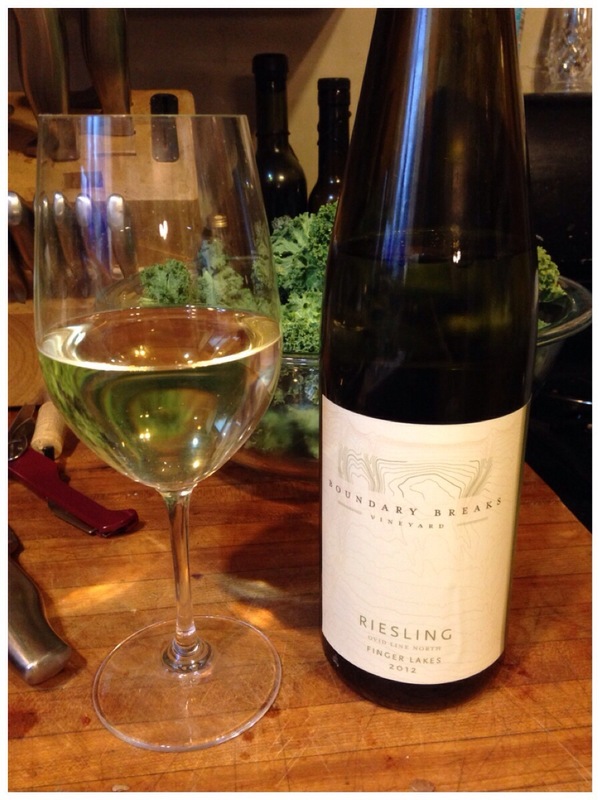 It’s a semi-dry made from a blend of different Riesling grape clones, and is the only blended source wine they make. Bright apple, apricot, lychee favors, with a slight acidic complexity and sweetness make this a very food friendly, flexible wine; the acidity is well balanced and the sweetness not at all overpowering. I am an admitted dry wine drinker, but living in the Finger Lakes has helped to open my mind (and palate) to all of the hidden gems sourced from our area. I recommend checking them out, Wine Spectator and Wine Enthusiast sure have! 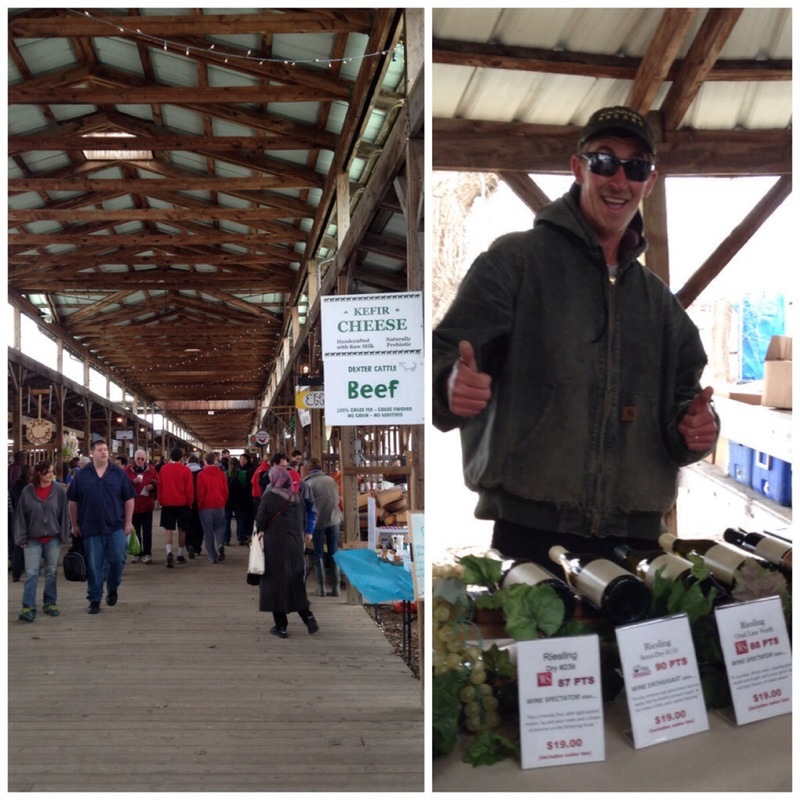 Excitingly, spring has sprung and some of our local farmers braved the chilly air to bring the first of their veggies as well. A time ago I read an article about foraging in the wild, and recalled fiddleheads and sunchokes mentioned as springtime delicacies. I’ve had the opportunity to taste (as well as bring back) fiddleheads from Nova Scotia, and we use them from the freezer stock throughout the year. Sunchokes (also called Jerusalem Artichokes) are the tuber root of a type of sunflower, and a cousin to the artichoke most of us are familiar with. WiKi sunchoke info It looks a bit like a potato or ginger root, and the skin can be peeled but is edible. Raw, the consistency was that of a sweet water chestnut. They can be roasted, added to salads raw, or cooked into a multitude of soups. 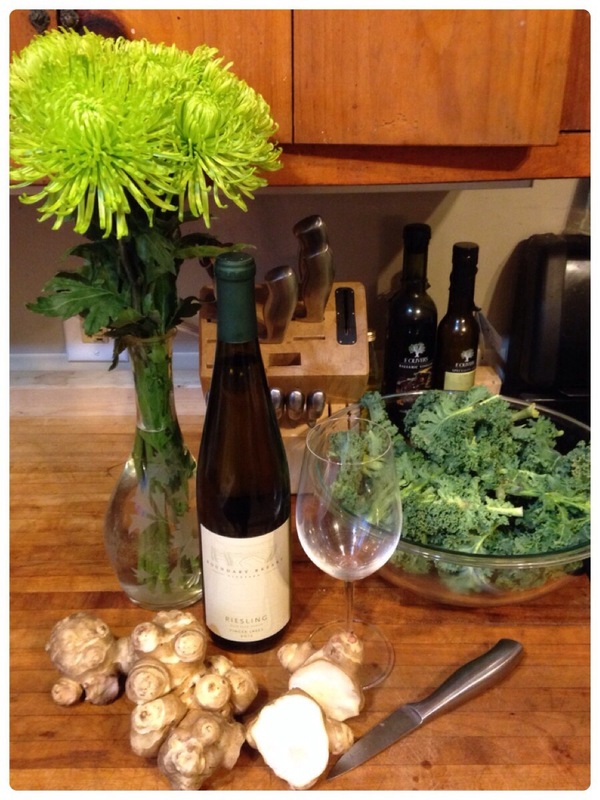 I excitedly grabbed a pound of the sunchokes in various sizes (along with a bag of kale for roasted kale chips), my bottle of wine, and looked forward to a creative night in my kitchen! Had to open the bottle of wine first, of course, but the actual dinner prep was a breeze. I treated the sunchokes like simple potatoes-washed of dirt and chopped, tossed with olive oil, salt, pepper, garlic, and roasted in a 375 degree oven until they were browned (about half an hour, 45 minutes). 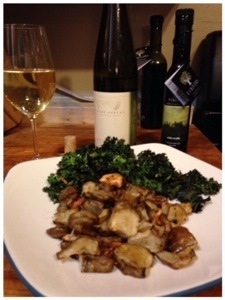 I added F. Oliver’s white truffle oil to finish the dish–I love that stuff way too much. 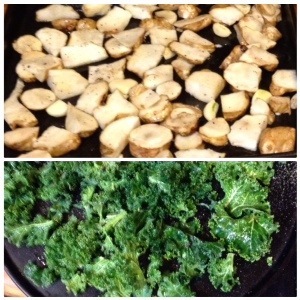 I also roasted my kale with the same ingredients (minus the truffle oil), for about 15 minutes in the same 375 oven. Keep your eye on kale, chips become cinders quickly if you’re not paying attention! The results? A locally sourced, adventurous and delicious meal! Once roasted, the sunchokes had the flavor of a sweet, nutty roasted artichoke minus leaves–maybe think just the stem, with a bit more potato-y density and starch. The flavor is mild and quite delicate. The wine was a lovely accompaniment to the flavor. Now, I was made aware that some people have digestive issues with the sunchoke, and the reaction can be the same as too much dairy or fiber…(the nickname ”fartichoke” came up once I did a bit more….ummm…research). I had no major noticeable issues, but this might not be the dish to impress a first date with 🙂 On that note, get out to your local farmers market, grab a veggie you’ve never tried, and experiment–you’ll be glad you did! Enjoy locavore adventures in your area!